President Donald Trump says he is a “hundred percent” sure that the woman accusing Brett Kavanaugh of sexually assaulting her when they were in high school named the wrong person. Kavanaugh was confirmed by the Senate on Saturday by a 50-48 vote. His Supreme Court nomination was roiled for weeks by allegations of sexual misconduct and drunken behavior when Kavanaugh was a high school and college student. Trump tells reporters on Air Force One that one of the reasons he chose Kavanaugh “is because there’s nobody with a squeaky-clean past” like him. Trump also says he believes a rally speech in which he mocked Christine Blasey Ford’s sexual assault allegations against Kavanaugh proved to be a turning point for the nomination. The remarks drew criticism from Democrats and Republicans in the Senate. Brett Kavanaugh has taken the oaths of office to become the 114th Supreme Court justice, just a couple of hours after the Senate voted 50-48 to confirm him. The quick swearing in enables Kavanaugh to begin work immediately in advance of arguments at the court Tuesday in two cases involving prison sentences for repeat offenders. The court says Kavanaugh took the oath required by the Constitution and another for judges that is part of federal law in the same room where the justices meet for their private conferences. The 53-year-old justice’s wife, children and parents were in attendance. Chief Justice John Roberts administered the constitutional oath and retired Justice Anthony Kennedy administered the judicial oath. Kavanaugh is replacing Kennedy on the bench and once served as his law clerk. Protesters are occupying the steps of the Supreme Court following the Senate’s confirmation of Brett Kavanaugh. Officers are blocking the doors to the court and are face to face with the protesters. Some of the demonstrators are hanging from the columns of the building, and women are sitting on the two marble statues beside the steps. Kavanaugh was confirmed as an associate justice Saturday in a 50-48 Senate vote. The Supreme Court says he will be sworn in as a justice later Saturday. President Donald Trump flashed two thumbs up when the Senate confirmed Brett Kavanaugh to the Supreme Court. He also criticized Democrats for what he called a “horrible, horrible attack” on Kavanaugh. Trump watched the vote Saturday in his private cabin aboard Air Force One as he flew to a campaign rally in Kansas. He invited reporters to join him as the votes were tallied. Trump blamed Democrats for the controversy over allegations of sexual misconduct when Kavanaugh was a high school and college student. Capitol Police say 164 people have been arrested at protests that took place as the Senate was voting to confirm Brett Kavanaugh to the Supreme Court. Most of them — a total of 150 people — were arrested on the steps of the Capitol’s East Front. 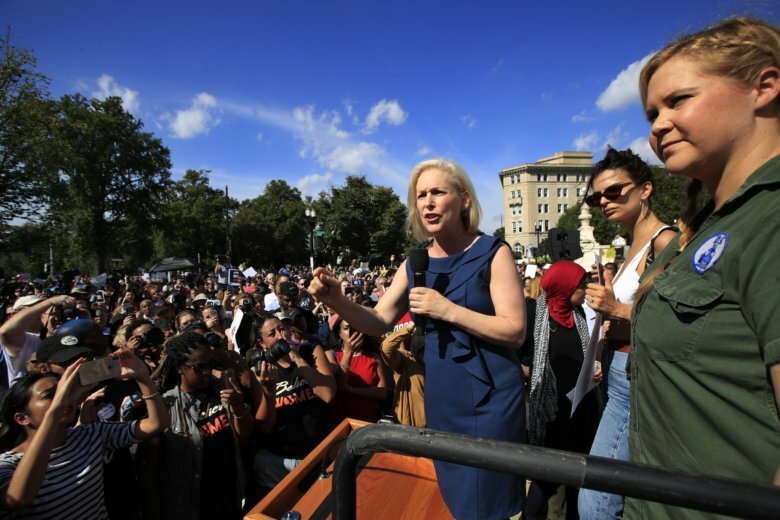 They were among hundreds gathered at the Capitol to protest Kavanaugh’s confirmation. Kavanaugh has been accused of sexual misconduct. He denies the allegations. Fourteen more were arrested in the Senate Gallery during the closely divided vote. All those arrested were charged with unlawful crowding, obstructing or incommoding, which means inconveniencing someone They were processed offsite and released. Protesters shouted “I do not consent” during the roll call vote on Kavanaugh. Senate Majority Leader Mitch McConnell says the Senate “stood up for presumption of innocence” by confirming Brett Kavanaugh to the Supreme Court. Kavanaugh was confirmed 50-48 Saturday during a historic roll call vote in the Senate chamber. The two-vote margin is one of the narrowest ever for a Supreme Court nominee. The Senate confirmed Kavanaugh despite the allegations of sexual misconduct against him. Kavanaugh denied the allegations, and Republicans say an FBI investigation did not corroborate them. Brett Kavanaugh will soon don his robes as a justice. The Supreme Court says he will be sworn in later Saturday. In a statement, the court says Chief Justice John Roberts will administer the Constitutional Oath and retired Associate Justice Anthony M. Kennedy will administer the Judicial Oath in a private ceremony at the Supreme Court. Both oaths will be administered so Kavanaugh can participate in the work of the court immediately. President Donald Trump is hailing Brett Kavanaugh’s ascension to the Supreme Court after an epic struggle to get him confirmed. The Senate has confirmed Brett Kavanaugh as an associate justice of the Supreme Court, putting a second nominee from President Donald Trump on the highest court in the land. Kavanaugh was confirmed 50-48 Saturday during a historic roll call vote in the Senate chamber. The two-vote margin is one of the narrowest ever for a Supreme Court nominee. The vote unfolded with protesters shouting from the gallery. The vote closes out a bitter struggle over Kavanaugh’s nomination, inflamed by accusations that he sexually assaulted women in the 1980s. Kavanaugh forcefully denied the accusations in sworn testimony. Protesters are disrupting the Senate’s vote on Brett Kavanaugh’s confirmation to the Supreme Court. Demonstrators began shouting “I do not consent” as the roll call on Kavanaugh began. Senators are seated at their desks for the vote. Vice President Pence, who is presiding, repeatedly called for the Senate sergeant-at-arms to restore order in the chamber. The protesters are being removed by gallery staff. The Kentucky Republican says Kavanaugh “unquestionably” deserves to be confirmed. He says the judge “will make the Senate and the country proud” as a member of the high court. The vote to confirm Kavanaugh as an associate justice began after McConnell’s remarks. A roll call vote is under way in the Senate on the nomination of Brett Kavanaugh to the Supreme Court. Senators are seated at their desks for the historic vote. If it succeeds, Kavanaugh will soon join the court as an associate justice. Republicans control the Senate by a 51-49 margin, and the vote seems destined to be nearly party-line. Sen. Joe Manchin of West Virginia is the only Democrat expected to vote for Kavanaugh’s confirmation. Sen. Lisa Murkowski of Alaska is opposed, but says she will vote “present” as a courtesy to another Republican who is out of town. Senate Democratic leader Charles Schumer is decrying the expected confirmation of Brett Kavanaugh to the Supreme Court as “one of the saddest moments” in the history of the Senate and the U.S. The New York Democrat criticized Kavanaugh in a Senate floor speech, saying he is a nominee “who doesn’t belong on the nation’s highest bench.” He said Kavanaugh is an “extreme partisan” who disqualified himself with testimony before the Senate Judiciary Committee. The vote to confirm Kavanaugh as an associate justice is expected to begin soon. Senators have been advised to be in their seats for the vote. Kavanaugh is expected to win confirmation by a narrow margin. Republicans have a 51-49 majority in the chamber. Schumer closed his speech saying Americans opposed to Kavanaugh’s confirmation need to vote in the midterm election. President Donald Trump says he’s looking forward to the Senate vote that’s vote expected to confirm his second Supreme Court nominee. He’s also praising Republican Sen. Susan Collins for the speech she delivered Friday announcing her support for the nominee. And he says he thinks the week-long delay as the FBI investigated sexual misconduct allegations against Kavanaugh was something positive. Kavanaugh has repeatedly denied the allegations. Trump is expected to watch the vote play out from aboard Air Force One as he flies to Kansas. Senate Judiciary Chairman Chuck Grassley is giving his closing argument for the confirmation of Supreme Court nominee Brett Kavanaugh. Grassley is praising Kavanaugh’s judicial independence in a speech on the Senate floor and he says the judge won’t be beholden to the man who nominated him, President Donald Trump. He accuses Democrats of doing “everything in their power” to make Kavanaugh’s nomination about something other than his judicial record and qualifications. Kavanaugh faced accusations of sexual misconduct from Christine Blasey Ford and other women. Ford testified that Kavanaugh sexually assaulted her when they were teens. Kavanaugh forcefully denied the accusations. A final vote has been set for Brett Kavanaugh’s nomination to the Supreme Court. The vote on confirming Kavanaugh as an associate justice will begin at roughly 3:30 p.m., and senators have been advised to be in their seats by the time the historic roll call begins. Republicans control the Senate by a 51-49 margin, and Saturday’s vote seems destined to be nearly party-line. Sen. Joe Manchin of West Virginia is the only Democrat expected to vote for Kavanaugh’s confirmation. Sen. Lisa Murkowski of Alaska is opposed, but says she will vote “present” as a courtesy to another Republican who will be absent for his daughter’s wedding. A few hundred protesters are gathering outside the Capitol before the vote. A group of them climbed the Capitol steps, and some were led away by police. A large crowd has gathered on the steps of the U.S. Capitol to protest Brett Kavanaugh’s nomination to the Supreme Court. A much larger crowd of protesters is watching the demonstration from behind a barricade. In between, a line of Capitol police officers is standing with plastic handcuffs clipped to their belts. The Senate is expected to confirm Kavanaugh to the Supreme Court on Saturday afternoon. Deborah Ramirez says the Senate is “looking the other way” when it comes to her accusation that Supreme Court nominee Brett Kavanaugh exposed himself to her when they were students at Yale. Ramirez says in a statement released by her lawyers that the FBI refused to speak to witnesses who could corroborate her story. She says senators are “deliberately ignoring” Kavanaugh’s behavior. The Senate is poised on Saturday to confirm Kavanaugh as an associate justice. The vote comes after Kavanaugh faced accusations of sexual misconduct from Ramirez and other women. Kavanaugh has denied the accusations. The FBI interviewed Ramirez as part of a background check investigation opened by the White House. The Senate Judiciary Committee says the FBI also interviewed two alleged eyewitnesses to the incident named by Ramirez and one of her college friends. The Senate vote on confirming Brett Kavanaugh to the Supreme Court is certain to be close, even if the outcome is no longer suspenseful. Enough senators have indicated they will support him Saturday to put him over the edge, with a likely margin of two votes. That’s barring a last-minute change of mind. But will the vote match the closest in history? The closest confirmation votes for a Supreme Court nominee were decided by a single vote. In 1881, Justice Stanley Matthews prevailed in a vote of 24-23. In 1861, nominee Jeremiah Black was defeated by a vote of 26-25. Among current justices, the confirmation of Clarence Thomas in 1991 was the closest, with a vote of 52-48. Eleven Democrats voted for Thomas, while two Republicans opposed his confirmation. The vice president can vote in the event of a Senate tie. That’s never happened in a Supreme Court confirmation. Melania (meh-LAH’-nee-ah) Trump is offering some supportive words for Supreme Court nominee Brett Kavanaugh. Speaking to reporters near the Great Sphinx, she says she’s glad that both Kavanaugh and his accuser, Christine Blasey (BLAH’-zee) Ford, were heard. Without weighing in on the sexual assault allegations that Ford leveled against Kavanaugh, Mrs. Trump says victims of “any kind of abuse or violence” must be helped. Kavanaugh denies the accusation. The Senate is expected to confirm Kavanaugh on Saturday. Democrats don’t seem to have the votes to keep Brett Kavanaugh from joining the Supreme Court, but that’s not stopping them from taking to the Senate floor in a parade of speeches into the early morning against the conservative jurist. Hours before the expected roll call vote that would elevate the appeals court judge to the nation’s highest court, Democrats are making clear their strong opposition. Allegations against Kavanaugh arose late in the confirmation process that he sexually abused women decades ago. He’s emphatically denied the accusations. Brett Kavanaugh seems assured of surviving a Supreme Court nomination fight for the ages after two wavering senators said they’d back him. The announcements Friday by Republican Susan Collins of Maine and Democrat Joe Manchin of West Virginia came after weeks of shocking accusations, hardball politics and Capitol protests. Their support makes Saturday’s vote to confirm Kavanaugh an apparent formality after a battle that riveted the nation for nearly a month. Republicans control the Senate by a 51-49 margin, and Saturday’s roll call vote seems destined to be nearly party-line, with just a single defector from each side. The vote caps a contest fought against the backdrop of the #MeToo movement and President Donald Trump’s unyielding support of his Supreme Court nominee.